It’s a bright day. I make sure that the cap of my flask is tightly threaded, and snug it in against the other contents of my rucksack. Outside the kitchen window, two male Reed Buntings are rummaging about in the dirt under a trailer of silage. The weather is fair, but the wind is brisk. Along the track to Tràigh nan Gilean, Glaucous Gulls from further north are mixed with our smaller Herring and Common Gulls. They are powerful birds, with a stern expression that invites no nonsense. The ‘glaucs’ hold their ground longer than the others; drifting away on bleached wings as I pass. Tràigh nan Gilean, viewed from the northern slopes. Winter tides have bitten back the dunes, leaving a smooth sandy face along the sweep of the bay. Reflected light from the beach hurts my eyes and makes them water. Blinking owlishly and peering along the shore, a mixture of tracks fade into the middle distance: the webbed patterings of gulls; the tiny running-tyrannosaurs of Sanderling; the aristocratic catwalk of ‘barwit’ or Curlew; and larger, more purposeful impressions. Ahead, I see a slim figure inspecting the strandline. They say it takes one to know one. With a wry smile, I continue to see what John Bowler has found. He’s doing his beached bird survey – something that I will also be completing later in the week. A dead Glaucous Gull has washed up with a number of other, more common winter casualties. As we chat, John has his back to the sea. Fulmars visiting the cliffs behind appear to fly in and out of his ears. Seabirds swarm around these cliffs like pale midges during the breeding season. 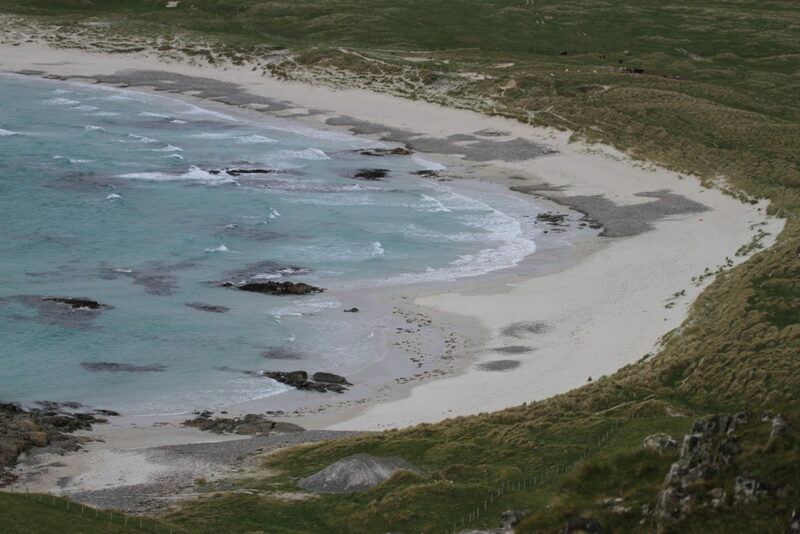 This is the largest colony on Tiree. Climbing Ceann a’ Mhara is an ideal way to discover just how sedentary one has become over winter. Last July, I could bounce up it in no time. Now, in February, I am consigned to leaning on fence posts and gasping like a carp. Gravity is kinder to the Fulmars. They swoosh past with smug abandon; toasty in their sleek down jackets and unfettered by dangling binoculars, cameras, snot, and the relentless wind blasting directly into their shrivelling eyeballs. Ceann a’ Mhara has a double summit. No sooner has one triumphantly staggered to the top of the first, than the sinking realisation that you’ve got to do it all again (this time, with more bogs) washes over you. The resident Raven pair look on, hunchbacked and eager; in the ardent hope that you’ll give up and die half way. 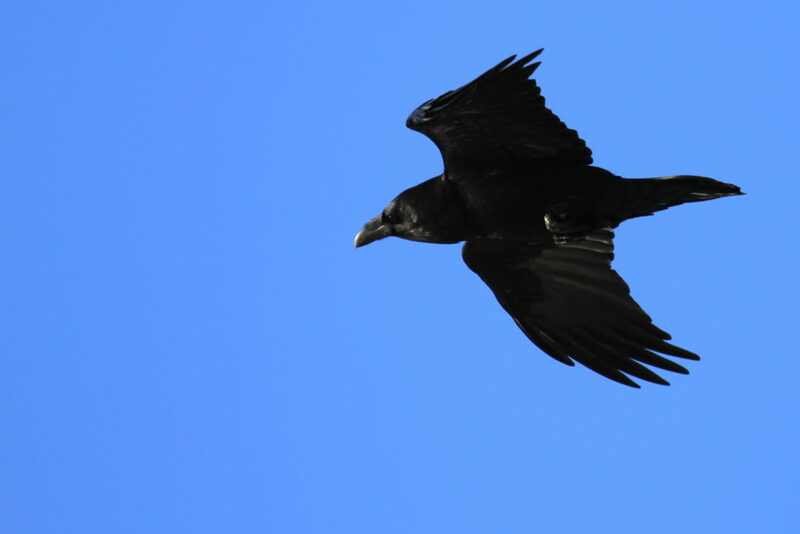 The Raven pair: boisterous, playful… but sometimes a little too alert to one’s wellbeing. After many visits to this headland, I have adopted regular ‘perches’. In relative comfort, I occupy these spots for hours at a time. Reveling in the endlessness of the sea, and the flow of commuting birds. It’s an opportunity to watch and to be watched. One of my more obvious ‘perches’. 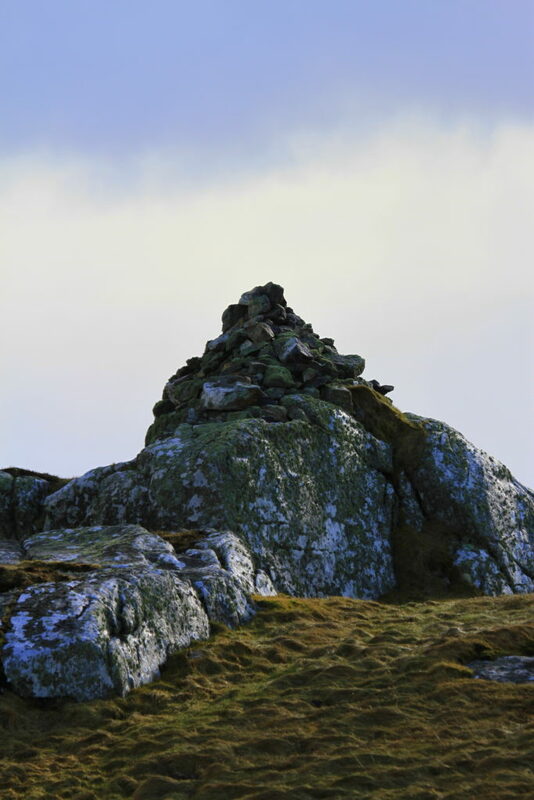 I can see this cairn very clearly from my kitchen window: it is a peaceful place. Fulmars are curious. If you are patient, one will come to you. As the oil drop of its gaze meets yours, something leaps across like an arc of electricity. For a split second, it’s possible to sheer between boiling waves in a sky-bursting tempest; settle against a cushion of thrift, with soft pins of pink flowers; or feel your leathery feet sculling above dim, unknowable fathoms of the Atlantic. Each time the moment passes and the connection breaks, the door between my world and theirs slams shut. I watch the birds and they watch me. I know my arrival at any perch is widely reported. I hear it in the mewling of the gulls, the growling of the Fulmars, the knocking of the Ravens. Two birds are silent. At other times of year, their shrill calls would shatter like glass on the rock faces – but in winter, they are content to hang between me and the sun. I never pass unobserved, or unescorted. This is a young bird – not one of the adult pair. They seldom come close enough to be photographed. 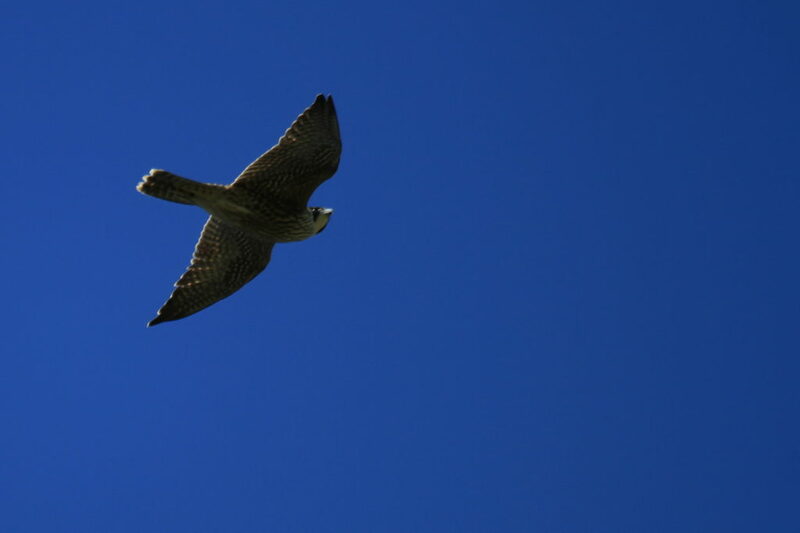 The Ceann a’ Mhara Peregrines specialise in being forgotten. Residents of cliff-ledge city must live with a constant, dull fear of assassination. When the Peregrines are sighted, anxiety roars through the colony like a Mexican wave. But it can’t stay like that all the time: sooner or later, birds must return to their business. And it’s then, in the quiet space between chimes of alarm, that you hear the thwack. If you are canny, you can find their resting places. Like me, the Peregrines have favourite perches (or roosts, in their case). Sometimes, a delicate barred calling card is left; perhaps caught on a wisp of grey lichen, with its tiny white filaments fluttering in the breeze. My bookcase holds several such treasures; laid out next to larger, midnight-black feathers picked up from the Ravens. Sometimes, field signs of an altogether more violent sort are left. 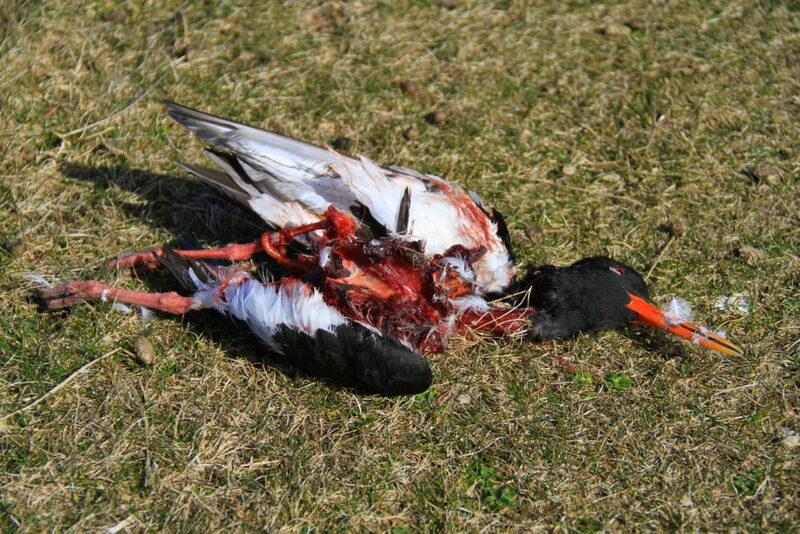 A Peregrine kill [Oystercatcher]. Note that the breast muscle and neck tissue has all been consumed; but not the more awkward and less nutritious parts. Sometimes, notches can be seen on the keel where bites have been torn away. I recently asked Dr Holliday what the name ‘Ceann a’ Mhara’ meant: It seems there could be a number of different origins. Several alternative spellings are in common use, even today. Pronunciation appears consistent (reflected in ‘Kenavara’). It is the written versions, and possible inferred meanings from different roots, that exercise the mind. 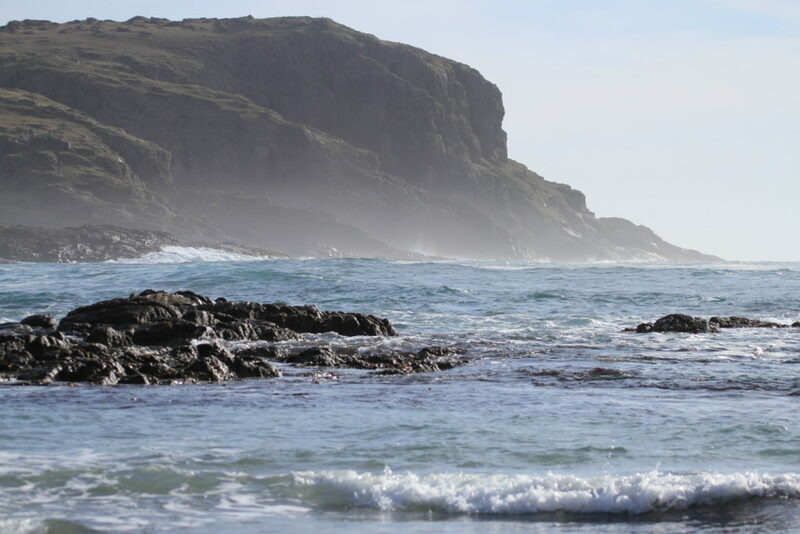 ‘Ceann a’ Mhara’ translates to a rather pedestrian ‘Headland of the Sea’. Those four, plain words do nothing. They give no indication of cultural significance, past events, traditional lore, essence: They are the linguistic equivalent of magnolia paint. Yet, you can feel people here – despite the wildness of the birds. I am sure that others have loved this place; that they have passed time in human reflection, resting their gaze on the indifferent water and letting their minds drift with the Fulmars. Indeed, Dr Holliday writes that there are 130 names associated with local landscape features. Many refer to spots along the western cliffs – where the Ravens, Peregrines and I watch quietly. Crofters, fowlers, fishermen, norsemen, first men. All came, and some never left. This is the truth told in names: The disappeared, the drowned, the fallen are remembered in marks on a map. The worked flints scattered along Tràigh Bhi are a breadcrumb trail into silence, and the oblivion of ages. The empty Bronze Age barrow on the hill’s southern flank hangs open like a mouth that cannot speak. The cottage in the dunes is hardly more than a tumble of boulders; home only to the mildewed bones of long-dead sheep. It’s frustrating. Unable to close my hand over the kernel of ‘Kenavara’, I must choose something of my own. One possible word root is a term used to describe watchtowers, or warning beacons: ‘Headland of the Beacon’. Well, that’s more like it. Any scramble in the settlements, as the orange light flared above, has been softly muted by the sands of time. Was it the keel-drag of ships on the beach that threatened? Whether smoke and bright fire ever fuelled sick dread at an oncoming danger, I cannot say. But for thousands of years, people have walked towards this beacon in our landscape. Like a moth to the flame, I am only the latest. This blog references work done by Dr John Holliday. 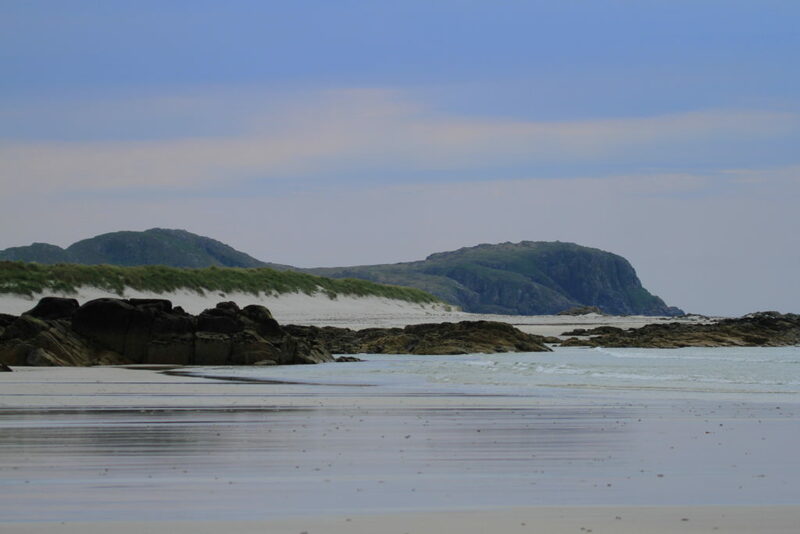 To read his fascinating page on Ceann a’ Mhara (and to lose yourself down a rabbit hole of Tiree Place Names) see: here.